We are a leading Manufacturer of mobile lockers and mobile phone lockers from New Delhi, India. We are the leading manufacturer and exporter of lockers, mobile lockers, hotel lockers, room lockers, personal lockers And many more. We are one of the Leading Exporter, manufacturer and Supplier of a diverse and a customise range of Safe Deposit Boxes. 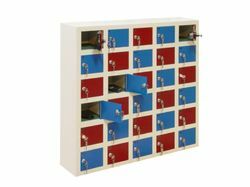 Looking for Mobile Phone Lockers ?